The latest Microsoft Office promotion is a rare example of an ad which shows how a product was deliberately crippled with less features. The ‘Twins Challenge’ is a series of very selective videos that are supposed to highlight differences between Office 2019 (single purchase, less profitable for Microsoft) and Office 365 (annual payment, highly profitable). Any guesses which Office version comes out on top in these examples? Of course, it’s Microsoft’s preferred Office 365. The videos (below) deliberately use features in Office 365 that aren’t available in Office 2019. They aren’t in Office 2019 because Microsoft specifically chose not to include them. Another way to look at the videos is a listing of ways Microsoft chose to shortchange Office 2019 customers. Microsoft says the video’s prove “Office 365 crushes Office 2019” which is ridiculous hyperbole. The self-serving videos show how Office 2019 was crippled by Microsoft. We call it an ‘ad’ but is it being shown anywhere much beyond the Internet and YouTube? Like other provocative ads, it’s aim is to provoke free publicity through the press. And it’s done that job nicely. Sidenote: was the music chosen to be deliberately annoying? The videos highlight features Microsoft chose NOT to put in Office 2019 and overlooks limitations in the Office 365 options. We like the Stock and Geography data types a lot. We think they are the single best addition to Excel, if not Office, for some time. It’s only available in Office 365. We’ve devoted a lot of time to this new feature including major updates to Real Time Excel. 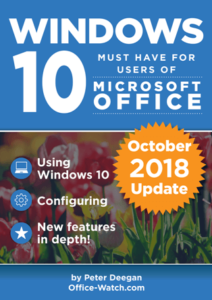 The Office 2019 twin in the video has an advantage Microsoft doesn’t mention. By finding and pasting the state info and statistics, the Office 2019 user can check the source and accuracy of the Excel data. The Office 365 user simply accepts that the information on populations etc. is accurate or up-to-date, which isn’t always the case. The PowerPoint 365 Designer is supposed to analyze a slide and suggest alternative designs. That’s great as a quick and dirty fix but the Designer suggested slides are bland, corporate looks that many audience members will be familiar or bored with. Microsoft loves pushing Ink technologies. People with a steady hand and some drawing skill make good use of it. Many Office customers don’t have the ability or the hardware to make ink features a practical option. ‘Ink to Shape’ is great for the many of us with little drawing ability, but Insert Shape has been there for years. ‘Ink to Text’ sounds great and works fine if you have the aforementioned steady hand. Too often Ink to Text can’t recognize scrawled letters; switching to the keyboard is faster. This video is even more shameless with promoting another Microsoft site, LinkedIn. Like PowerPoint Designer, Word/LinkedIn resume templates are a ‘quick and dirty’ solution. They aren’t the complete answer to writing a resume with lot’s more work to be done after Office 365 handles some basics.